MainAll NewsInside IsraelHow to make people rethink their view on Israel? How to make people rethink their view on Israel? Rethink Israel Initiative's Gerald Ostrov explains how to engage the young American population with Israel. Gerald Ostrov, CEO of the Rethink Israel Initiative, on Monday said that the Boycott, Divestment and Sanctions (BDS) movement is a “disease” and that its symptoms must be dealt with, but also the “core underlying roots”. 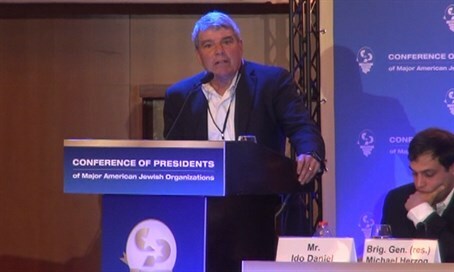 “70% or more of Americans don’t know, don’t care and aren’t interested in Israel,” he said at the gathering of the Conference of Presidents in Jerusalem. The haters, said Ostrov, “are not the ones we should be focusing on” but rather the 70% who are uninterested in Israel. Rethink Israel focuses on “food, nature, arts, lifestyle, health, innovation - all the things that distinguish Israel from our adversaries,” explained Ostrov, who encouraged the use of social media to get the message across as young people today get most of their information from social media. “In Israel, we have a great product. If we take that product and we market it well, and proactively positively engage with the masses on the campuses, we can reach these folks,” he stressed. Engaging people with Israel could increase positivity towards Israel by up to 70%, according to Ostrov.